Below you will find IPS 2019 Application Form. Indian Police service or IPS is the national level examination which is scheduled in the month of June 2019 by the official authority. A large number of students appear in this leading examination with the dream to get the job of IPS officer. Aspiring students who wish to take this reputed examination are required to fill the application form first. The students are suggested to determine their eligibility status for the exam so as to apply for the same. • First of all, the students should have the valid email id and the personal mobile number. All the communications shall be done through the electronic medium and no physical communication will be done by the commission. • The students should have the scanned copy of the important documents which are required to be uploaded along with the IPS Application Form 2019 such as photo and signature. • The photo should be of high – quality and taken in the professional studio. The applications with low quality photographs are liable to be rejected. • Also, the photograph should be recent and easily identifies the student. • The face of the student should not be covered with hairs, shadow, and scarf. • The application form should be completed only after going through the important official guidelines. • The students are required to submit only single application form as the multiple forms lead to the confusion. However, if due to some reason the applicant submits more than one application form then the form with higher registration id will be accepted by the official authority. • All the details entered in the IPS Registration Form 2019 should be correct and genuine. No alteration shall be allowed once after the final submission of the form. • The requisite application fee is Rs 100. The female and SC/ ST students are exempted from the payment of the registration fee. • Also, those students who will be admitted to the main exam will have to pay the additional fee of Rs 200. • The direct link to complete the application form shall be provided here soon after its availability. • On adding these details, the candidate will receive the registration number or registration id. This will be used till the end of the selection procedure. • The next step is the uploading of the scanned images of the photo and signature as per the official guidelines. • After uploading the scanned files, the students need to move towards the next step i.e. the payment of the application fee. The students can easily pay the application fee either by using the net banking or bay paying through cast in any of the SBI bank branches. 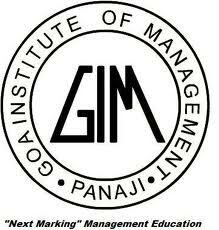 The Goa Institute of Management (GIM) is a business school located in the state of Goa, India.